Membership contribution is most welcome and encouraged! Back issues of AerialViews are being made available to members in PDF format. These are in a highly compressed form for easy distribution on the web. Higher resolution versions have been created for archival purposes. If you need a high resolution version, or to get the password, please contact a member of the executive. New blocks of issues will be added on a regular basis. 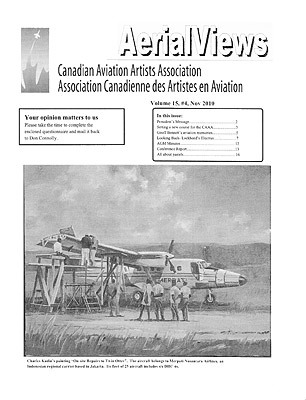 Copyright Canadian Aerospace Artists Association. All rights reserved no duplication of site images or content without permission.